Sometimes referred to as liquefied petroleum gas or LPG, propane is a nontoxic fuel used by millions of Americans each day. It was discovered in 1910 by Dr. Walter O. Snelling, a chemist with the U.S. Bureau of Mines. After a series of experiments, Dr. Snelling became the first man to realize that propane could be used for lighting, metal cutting and cooking. Since then, the propane industry has continued to grow and thrive, with new technologies emerging every year. Today, propane is used by thousands of Chili Gas customers for furnaces, boilers, water heaters, outdoor grills, fireplaces, pool and spa heaters, and various other appliances. In addition to these residential customers, Chili Gas delivers propane to commercial businesses, including local hotels and restaurants that depend on it for heating and cooking. Propane is also used on farms to fuel machines that control pests, dry crops and power irrigation pumps. Other industrial propane users include propane-driven forklifts and fleet vehicles. According to the Propane Education & Research Council, there are up to 56,000 miles of pipeline and more than 6,000 retail dealer locations that supply propane throughout the U.S. We at Chili Gas are proud to be a part of this fuel family and always do everything we can to ensure that our products are available 24 hours a day, 7 days a week, 365 days a year. Aside from the many uses detailed above, propane can be used for radiant heating, space heating and direct vent fireplace heating. 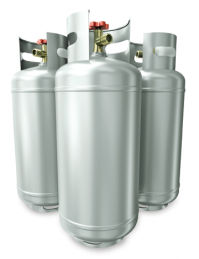 Furthermore, propane tanks can be installed aboveground or underground. According to the National Propane Gas Association, approximately 90 percent of the United States’ propane supply is domestically produced, and of the remaining 10 percent, 70 percent is imported from either Canada or Mexico. That means that as much as 97 percent of all propane consumed in the U.S. comes from North America. As an approved, clean fuel listed in the 1990 Clean Air Act and the Energy Policy Act of 1992, propane is considered one of the cleanest burning fuels on the market. Safe for the environment and for your home, propane is nontoxic, meaning it doesn’t harm soil or water. Plus, it is treated with an identifying odor, so in the rare event that a leak occurs, you will be able to smell it and stay out of harm’s way. We have more than 25 years’ experience in residential, commercial and industrial propane sales and delivery, so when we arrive at your home or business, you can be sure that it isn’t our first time around the block. Our drivers are fully licensed, our technicians are fully certified, our knowledge of propane is unparalleled, our services are available 24/7, and last but definitely not least, we promise to do everything in our power to get you the fuel you need at a price that you can afford. Contact Chili Gas today to learn more about the benefits and uses of propane.